Ideally located in the heart of Hanoi`s Old Quarter - Gia Ngu Street, on the bank of Hoan Kiem Lake (Lake of Sword Restored), is very convenient for guests with shopping and banking facilities, as well as eating and entertainment options. In addition, Tirant Hotel Hanoi is also close to the main tourist attractions: Quan Su Pagoda (1500 m), Hanoi Grand Ethnology (400 m), Hoan Kiem Lake (nearby), Hanoi Opera House (800 m), Temple Phu Tay Ho (2500 m), Temple of Literature (1500 m), Water Puppets theatre (50 m), Tortoise Pagoda (50 m), and Ho Chi Minh Mausoleum and Museum (2000m). While staying in Hanoi, guests can visit other nearby points of interest, such as: Perfume Pagoda (70 km), the Ancient capital city Hoa Lu (100 km), Tam Dao mountain resort (100 km) or the Ha Long Bay (one of the natural wonders of the world, designated by UNESCO as a world Heritage site) (175km). Our Deluxe Rooms are lavishly styled with glass enclosed showers, 9 ft ceilings, 46 in, HD plasma televisions and an abundance of other amenities. Our Executive Suite Rooms also include a 50 Sq ft private balcony, overlooking to Hoan Kiem Lake. If you would like to upgrade further, our Executive Suite Connecting Rooms offers the same amenities as our other rooms. Our Grand Suite Rooms offers 700 SQ ft of living space, his and her closets, two plasma televisions, and a separate living room. 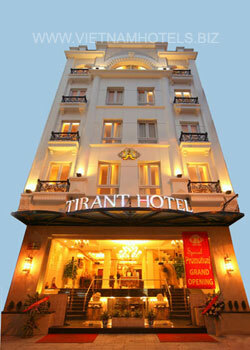 Allow us to customize your travel experience at Tirant Hotel in Hanoi. Especially, the Level Floor with pillow menu, private breakfast, express check-out and other exclusive services will make you feel very comfortable. A leading elegant Vietnamese restaurant offering authentic Vietnamese refined cuisines with impeccable standards of service. Open daily from: 11:30 a.m. - 2:30 p.m. & 5:30 p.m. - 10:00 p.m.
Might take forever for Tapas fever to hit Vietnam, but this Hanoi spot of Latino Bar make up for all those years.As the city’s first authentic Tapas bar, Latino, officially opened on October 28 th, offers around 30 types of Tapas with two distinctive sections of Spanish classics and fusion creations.To accompany our Tapas, the bar features over 70 exotic cocktails as well as a wide selection of wines from Spain, Chile and Argentina.There is live Latin music nightly. Salsa and South American rhythms float from the speakers, and on the dance floor the fire is intense.Consisting of bar lounge, counter, and ample terrace for al fresco dining, Latino Bar is a unique and exotic Latin venue in Hanoi.